We possess ultra modern manufacturing facilities. 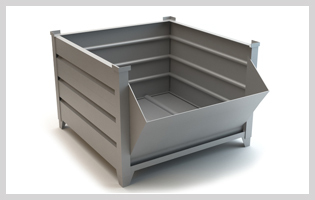 We make use of high grade steel and metal to fabricate these stackable metal bins. For the bulk storage, space saving system is being popular. These small stackable metal bins can be inter-stacked and use to carry out the weight. These bins contain racking mouth which ideally fit into racks. The arrangement of the bins helps to pick up the items from the bins. Metal bins are extensively used to store small products and finished goods. These bins are arranged in racks and racks can be stacked with these bins. The racks can be rearranged by unstacking the racks and again stacked as desired pattern. The interlocking racks ideally arranged to support the system. These bins are made from high grade steel and metal. It can be customize for different types of requirements. Metal bins contains solid front and drop handles to make easy transfer of material at work places.